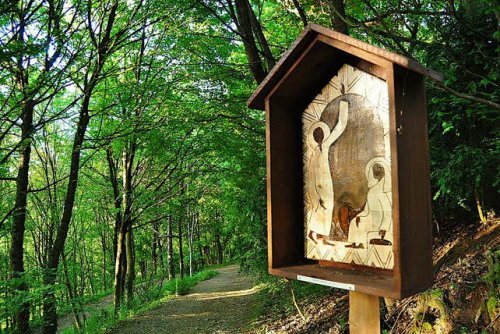 In spring 2015, icons made from tree bark were put up on the path down to St Stephen’s Source, the place set aside for silent meditation in Taizé. 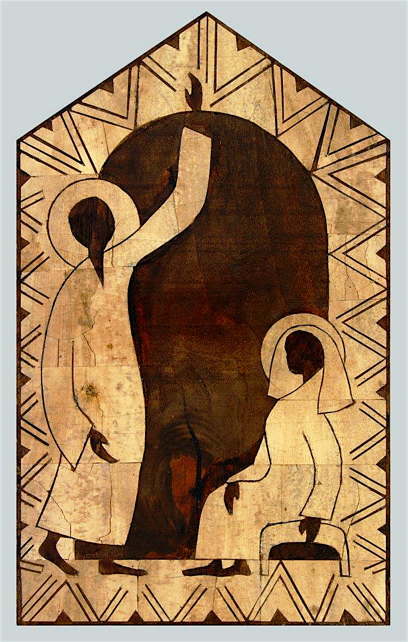 These icons were prepared in the worshop of the brothers living in Nairobi by Brother Denis, who entered into eternal life on 28 November, 2015. 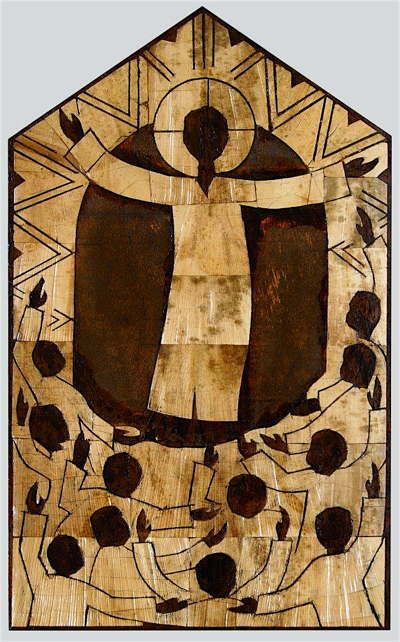 Brother Denis’ work was also the subject of an exhibtion in Taizé, "From Scrap to Art". 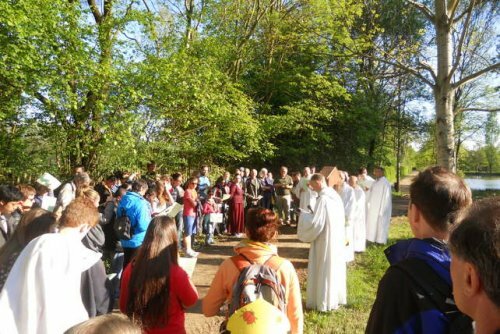 This "Way of the Gospel", was inaugurated at the end of April 2015 through a pilgrimage with Brother Alois, several brothers of the Community and a hundred or so young adults who were in Taizé that week. The pilgrimage was led by students from the Institute of Protestant Theology in Paris, who read different Gospel texts and shared a meditation at the last stations (see the text below under "Pentecost"). 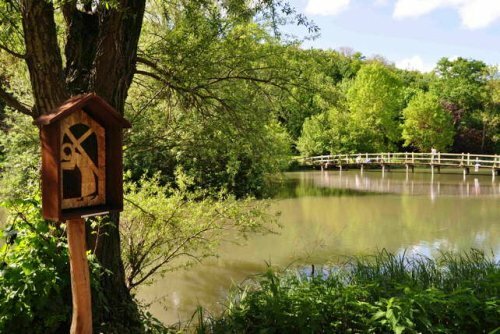 Since then, throughout 2015 a workshop was offered with the theme "A Gospel Path: walk and prayer towards St Stephen’s Source, accompanied by scenes from the Gospel created by the workshop of the Taizé brothers in Nairobi using local bark." Below you will find six of the eighteen stations. 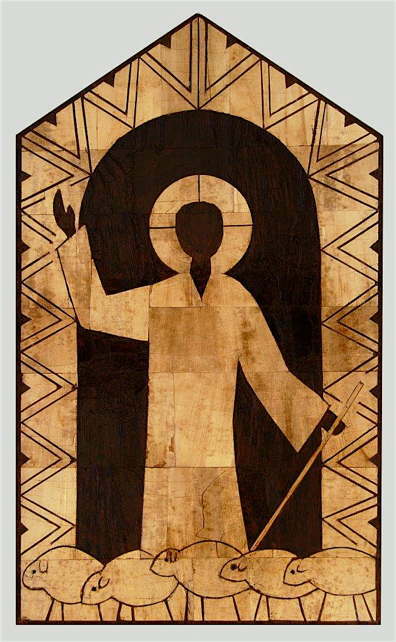 A booklet will be published at the beginning of 2016 with all the icons and texts for each stage of the pilgrimage. Mary said to the angel, "I am the servant of the Lord; may it happen to me as you have said." And the angel left her. This visit from the angel was a promise but also a call requiring a response: an irrevocable yes, a yes given freely. 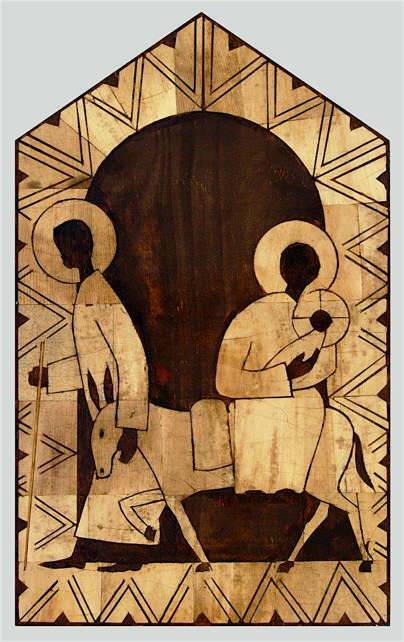 Pray for all who are called to commit their entire lives through a simple yes..
Then Joseph got up, took the child and his mother by night, and went to Egypt. Jesus is no longer simply homeless. He is on the run and will be soon a refugee in a foreign land. Pray for migrants, refugees and people in exile. Jesus said, "I am the good shepherd. I know my own and my own know me, just as the Father knows me and I know the Father. And I lay down my life for my sheep." Pray for all in the Church who have a ministry as shepherd - Pope, bishops, priests, pastors, or lay leaders. Jesus said, "So if I, your Lord and Teacher, have washed your feet, you also ought to wash one another’s feet. For I have set you an example, that you also should do as I have done to you." We are therefore invited by Jesus to the humblest service of our brothers and sisters. Pray for all who serve with love in hospitals or care homes for the elderly. Jesus said to her, "Mary!" She turned and said to him in Hebrew, "Rabbouni!" (which means Teacher). Jesus said to her, "Do not hold on to me, because I have not yet ascended to the Father. But go to my brothers and say to them, ’I am ascending to my Father and your Father, to my God and your God.’"
Called also by our name, how we would like to hold on to Jesus! But no, he says to us, "Go and tell them!" 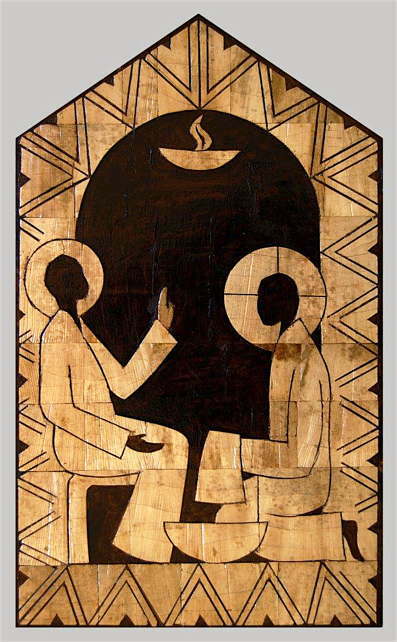 Pray for all people today who are seeking to be witnesses of the Resurrection where they live. 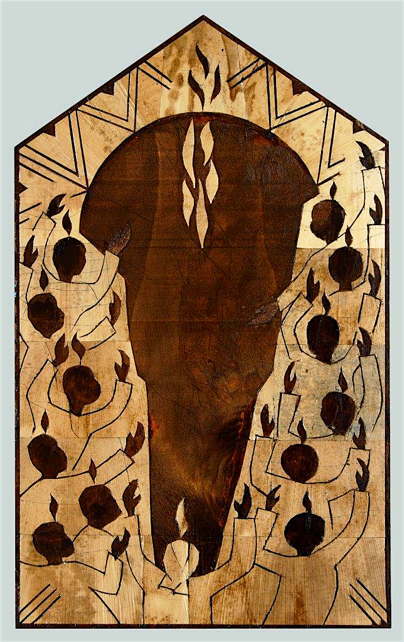 When the day of Pentecost had come, the disciples were all together in one place. And suddenly from heaven there came a sound like the rush of a violent wind, and it filled the entire house where they were sitting. Divided tongues, as of fire, appeared among them, and a tongue rested on each of them. All of them were filled with the Holy Spirit and began to speak in other languages, as the Spirit gave them ability. We are not orphans, but dwelled in by the Holy Spirit, who bestows us with gifts so that we can go towards others everywhere. Pray for the Church, for churches, and for the reconcilation of Christians "so that the world might believe." Jesus Christ sent his Spirit upon the Apostles and promised to do the same for us. A tongue of fire rested on each one of them. The Holy Spirit breathes on each one of us. Why should that happen to me? What have I that is special? Look at nature around you. The ant, the tree or the fish don’t have the same position, but each one is needed in Creation’s balance. So in the same way, if you don’t hold the place that God has given you, something will be lacking. Jesus Christ on the Cross, Jesus Christ, risen from the dead, followed his mission to the end and he calls us in his steps. You have a place to take, your place, which God has prepared for you. The gifts that the Holy Spirit has given you will help you hold it at the heart of the world. We recognise the Holy Spirit by the fruits of love, joy, peace, patience, kindness, goodness, faithfulness, gentleness and self control. So listen, give ear, hollow out your silence. For that is where the path is revealed.